It took nearly 12 hours from the field of 155 to be reduced to a winner here in the $1,150 Monster Stack. And in the end, only Andrew White was left standing. White, a local cash game regular from here in Sydney, started the day closer to the bottom of the standings than the top, but he grinded it out, caught cards at the right time, and in the end, finished on top, locking up $103,359, his largest record tournament score ever, and a World Series of Poker Circuit ring. One of the last ones of the stop. "I only started playing live tournaments in the last year and a half," White explained. "I bricked a lot. Bricked a lot. But it's good to finally get one on the board. I was joking earlier with a friend that I swapped a piece with that it would be nice if won of us got the win today." Despite not having success at first, White said he didn't change his strategy coming into the event. He felt like he was playing well, but results just hadn't come yet. "It's just luck, mate," White said. "These tournaments are pretty crazy. "It's a monster stack, but we were pretty shallow by the end of it. I ran well to get here. Day 1 was crazy. I had 200k then I was down to 9k yesterday, but I got all the chips today, so I'm pretty happy about that." Players began the day over 100 players off the money. But it didn't take long to hit the mark. Not long after the first break of the day, the bubble burst and there were plenty of casualties before that point. Start of the day chip leader Rahim Hosseini didn't make it into the money, and neither did Nick Varnavelius, who started the day near the top of the chip counts as well. Varnavelius was eliminated in cruel fashion when he turned quads with pocket eights and his opponent rivered quads with pocket kings. Others who didn't quite make it into the money included Rafe Aman, Jarryd Godena, Errolyn Strang, Ricardo Faura, Matthew Howearth, and Gordon Huntly. Once the bubble burst players started hitting the rail even faster than before. Recent ring winner John Conomos was first to fall. Conomos was extremely lucky to fade the bubble as just after a player busted, he was forced all in from the big blind holding jack-deuce offsuit. He didn't catch up in a five-way pot and was the first to walk away after the bubble broke, taking home $1,846. Other notables to make it into the money include Alexander Rich (51st for $1,846), Andrew Fisher (44th for $2,014), bracelet winner Jarred Graham (35th for $2,226), Paul Tartak (29th for $2,818), Daniel Laidlaw (12th for $7,735) and Hannah Lee (13th for $6,326). Lee had quite the start to the day, chipping up to nearly 3 million after the bubble burst. For much of the tournament, it seemed as if opponents wanted to give Lee chips. In one pot, Chris Ozer even shoved all in against Lee with ace-high after she had flopped quads. But in the end, she ran face-first into some tough spots and wasn't able to recover. In her final hand, Lee would shove pocket eights into the ace-king suited of Selvan Eswaralingam, but couldn't win the race and finished in 13th. It wasn't all smooth sailing for White either, but at some point, something clicked, and the cards started coming his way, allowing him to chip up at the right time. "With about three or four tables to go, I got moved from the breaking table," White said. "I started to pick up a few hands, and I went from 140,000 to about a million in one orbit. Then I just looked around at the table and felt pretty good about it. Some pretty good players left, some guys I used to battle with in the heads-up streets." Action at the final table went relatively quickly, as by the time players got to the final table, they were relatively short stacked. First to go was Pratik Mehta. Mehta shoved his short stack in the small blind and was called by Linh Tran in the big blind who was holding pocket sevens. Mehta held queen-nine but couldn't catch up and hit the rail. Next to go in a massive cooler was Blake Lockwood. Andrew White opened with a raise under the gun and Lockwood shoved right around 20 big blind all in over the top. White snap called with aces and Lockwood was just holding ace-king. He couldn't catch up and hit the rail in eighth place. White also eliminated Selvan Eswaralingam in 7th place. Eswaralingam shoved on the button with king-jack with a very short stack, and White called in the big blind with queen-five. The river was a five, and that would spell the end for Eswaralingam. "At the final table I felt very comfortable," White said. "With my position, with my stack. I coolered BJ [Lockwood] at the start, and that was a big turning point. I went from four million to eight million or whatever. After he was eliminated, it was relatively smooth sailing." Adam Monaghan would fall in sixth place. He shoved all in over the top of a raise from Tony Kambouroglou and Kambouroglou tanked for some time before calling. Monaghan had pocket jacks while Kambouroglou was holding ace-king. An ace and a king on the flop would spell defeat for Monaghan, and he hit the rail. Next to go almost immediately after was Michael Culling. Most of Culling's stack was committed to the big blind, and he called off when David Neumann moved all in on the button. Neumann held ace-eight while Culling had king-three suited. Neumann flopped an ace and held on to take Culling out of the tournament. Chips would change hands for a bit between the final four with players getting even stacked for a while before Neumann finally dropped. He shoved all in over a raise from Tran with ace-six, but Tran was holding ace-jack. Tran called and held on with the better kicker to eliminated Neumann in fourth place. Tony Kambouroglou would fall in third not long after. White opened with a raise to 900,000 and Kambouroglou moved all in over the top for nearly seven million. White snap-called with ace-king and held on to win against Kambouroglou's ace-jack. Heads-up play didn't take long either. White took down most of the post putting Tran on a short stack, and after just a few hands, Tran shoved all in with eight-four suited. White called quickly in the big blind with king-nine offsuit. When neither player connected with the board, White's king-high would hold up and earn him the victory in the tournament. "Once we got heads-up, that's my specialty," White said. "I felt good about it, and I finished it off." 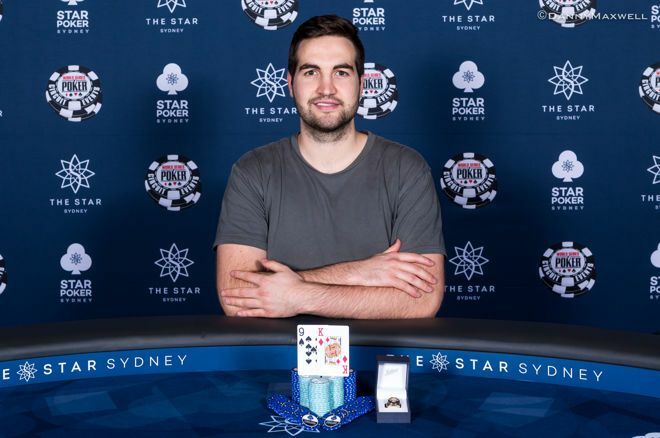 That does it for PokerNews' coverage of the World Series of Poker International Circuit Event here at The Star Sydney. It's been an exciting three weeks of poker. 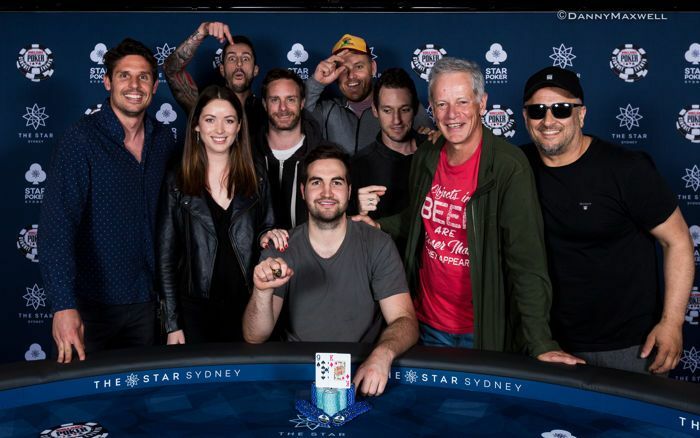 With one event still running, be sure to check into the Star Sydney's website for updates on the final ring event as well as updates to the race for Casino Champion which will award a seat to the Global Casino Championships next year. Get Your £50 Bonus for Slots, Live Casino, and Table Games!